There’s no finer way to travel between Adelaide and Alice Springs than Topdeck’s Outback Gem tour. See the best of South Australia including the Flinders Ranges, a Clare Valley winery, Parachilna, Quorn and underground mining town Coober Pedy. In the Northern Territory see sunrise over Uluru and camp under the stars near Kings Canyon for an amazing Outback experience. Day 1: Adelaide to Parachilna There are more wineries around here than flies on a sheep. On our way to the Clare Valley, we’ll stop at the Barossa Reservoir Whispering Wall – there’s a time and a place for confessions. This isn’t it. There is a classic Aussie pub at the end of the road today. Day 2: Parachilna to Quorn Flinders Ranges National Park is a spoiled brat, it has everything. From mountains to gorges and creeks to rivers, you’re lucky you get to play in it today. Take a hike to Wilpena Pound – a natural amphitheatre about three times the size of Uluru. Then to rock art site Arkaroo Rock. Day 3: Quorn to Coober Pedy Destination: Coober Pedy. Where locals live in homes carved deep underground to escape the heat. Along with these subterranean houses, this place is know for another little gem. Opals. 75% of the world’s opals come from here. We’ll take a mine and town tour to check it all out. Then: time to meet the orphans of the kangaroo world and learn more about how abandoned joeys are nurtured back into the wild. Day 4: Coober Pedy to Alice Springs It’s time to cross the gemstone littered and soft grounds of the Moon Plain up the middle of Australia. Then, check out the world’s longest Dingo Fence (good thing there’s a gate) and truck on past some very remote roadhouses before crossing the border into the Northern Territory. That resort pool is just what the doctor ordered. Day 5: Alice Springs to Uluru We’re hitting the red ground running as we take to the road and head into Yulara (the gateway resort to Uluru) for lunch. It’s off to the breathtaking Uluru in the afternoon for a guided tour, and a glass of bubbles as the glow of sunset morphs through 50 shades of red. Tonight hone your Aussie BBQ skills and cook your own steak (or veggie burger). Welcome to the outback, mate. Day 6: Uluru Start your day with a big bowl of ‘oh my god’ thanks to a breathtaking sunrise back at Uluru. Follow in the footsteps of the traditional owners of this sacred World Heritage site with a full base walk, where you can escape the crowds and check out hidden waterholes. Keep watch for wedge-tailed eagles, spinifex hopping mice and thorny devils. Or splurge on a Harley ride or scenic flight and soar over the rock. Later, join an optional meditative dot painting class in the Aboriginal Art Markets and give yourself a free astrology lesson, stargazing at the endless Southern night sky. Day 7: Uluru to Kings Canyon After a hearty breakfast, we spend a few hours back in the National Park. This time get ready for some soul searching as we venture into the heart of sacred Kata-Tjuta (The Olgas) and walk amongst the 36 red sandstone giants through the Valley of the Winds. After a drive into Watarrka National Park, live the life of a jolly swagman as we sleep under the stars in custom swags. Cue campfire stories and marshmallows tonight. Day 8: Kings Canyon to Alice Springs If you would walk 500 miles (steps), then you’ll make it through the toughest part of the Rim Walk – Heart Attack Hill. The Kings Canyon Rim Walk is the real deal and the most famous canyon in Oz. Think age-old cycads, eroded dome shapes, a visit to The Lost City – and that’s not even the best part. The sheltered valley and waterhole of the Garden of Eden makes today bloody bonza (translation: awesome). After a picnic lunch, we’ll board the bus back to Alice Springs. Our trip might be wrapping up, but there’s a whole lots of Oz out there. Are you ready for another adventure? Day 9: Alice Springs Wake up. Rub eyes. Climb into a hot air balloon. Just saying, it’s an option…and an amazing start to the day. Back to earth venture on an excursion out amongst the Western MacDonnell Ranges. Our stops include the peaceful Simpsons Gap and the impressive Standley Chasm. It’s back to Alice Springs to grab a late lunch and explore the town centre. This afternoon, have a wander. There are local Aboriginal art galleries to check out, the Desert Park Gardens to explore and the Reptile Centre to get creeped out in. 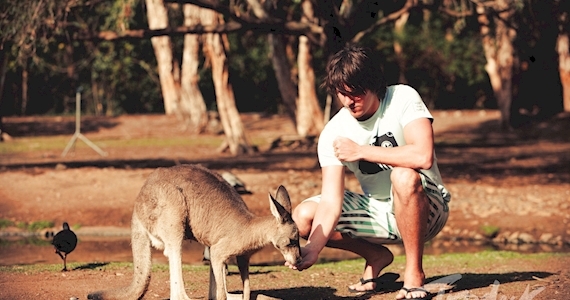 Book in the optional late afternoon Kangaroo Sanctuary tour for sunset.